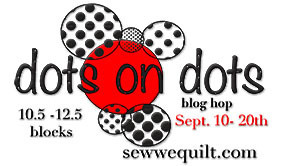 Welcome to the Dots on Dots blog hop. If your here for the first time. Please hang out and look around some. Here at the Moon. There is quilting, sewing, cooking, baking and lots of loving!!! 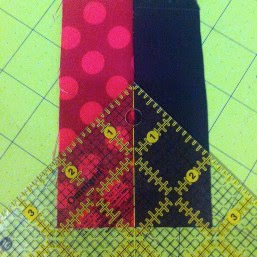 The challenge of this hop was to make a quilt block with dots. I love dots!!! I knew just what I was going to do. I had been thinking about this block for a while. I had seen something like it before. But I could remember where..... and couldn't find a tutorial. Soooooo... I took a shot at it, my way. It is a pretty old school way to do it. But, I am going to share what I came up with. I hope you like it!!! Here is the 12 inch block I made for the hop. I call this block "Echo Star". I used Michael Miller's TaDot in three colors. First, I drew it out on my beloved graph paper. I have every computer program imaginable for these sorts of things....... But, I always go back to a pencil and paper. Away I went. Cutting and piecing. But, Look it does!!!!! Isn't she pretty??? If you want to try one......... Here goes! This is how I made the Stripy HST. Sew 2 strips of a solid and a print. 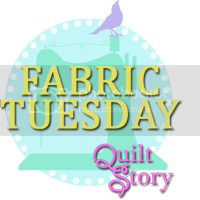 Using a square or triangle ruler....Cut triangles lining up the seam in the middle of the triangle (slightly larger than you will need) Cut 2 with the solid on the right and 2 with the solid on the left. 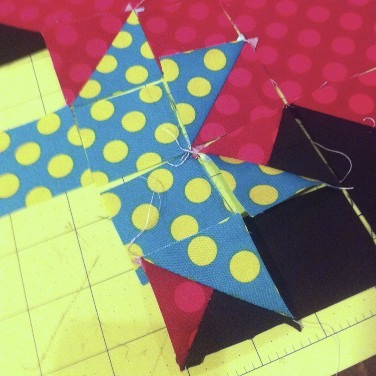 Sew the stripy triangle to a whole triangle to make the square you need. Square up to the correct size. That will give you the 4 you need. Lay Star 1 out first. The pieces are so small. It is on my 6 inch square ruler. Then lay it all together. What you do with your block is up to you. I made a Mini quilt for my desk. By adding some black around the block to suit me. And I straight line machine quilted it. I used some more TaDot to bind it. You see, my desk was a mess!!!! I would be nicer to it. to make my mouse pad pretty too. I Just traced my mouse pad onto fabric. Ironed the Wonder-Under to the fabric. Peeled the paper off the back and ironed fabric to the old ugly mousepad. Good as new. And pretty too!! Another thing ....... I am a beverage-aholic. (It rarely has alcohol in it silly, I know what your thinking....). I do love my Mason Jar. But, it does sweat. And it is often on something important. Leaving water rings everywhere. So, I made a cozy for my jar!! And, a coaster for when my jar is really having a sweat. My daughter Brie thought I needed some better pictures, since my office is kinda dark.... I think she just wanted to play outside. So, we went outside and shot these. And Brie.... likes the outside very much. 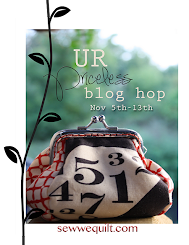 I hope you all enjoyed my Dots on Dots blog hop post!!! 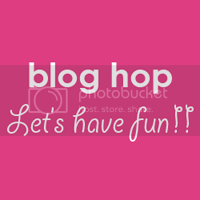 Please visit the other bloggers in the hop!! Here are the bloggers hopping today!!! 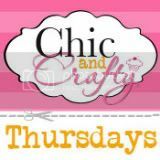 Get the list of Bloggers and the schedule by clicking the badge below. I would LOVE to see a picture!!! I love your dotondotstaronstar and everything you did with it! Your darling Brie has an eye for beauty, she's right, the outside pictures are magazine worthy. Enjoy these great additions to your desk. Ooooh I love your block and all the other bits and pieces - I am looking for a star pattern to use with some star wars material I have, although I think this one will be too busy as the fabric has got writing all over it, but thanks for the tutorial - might have a go one day! 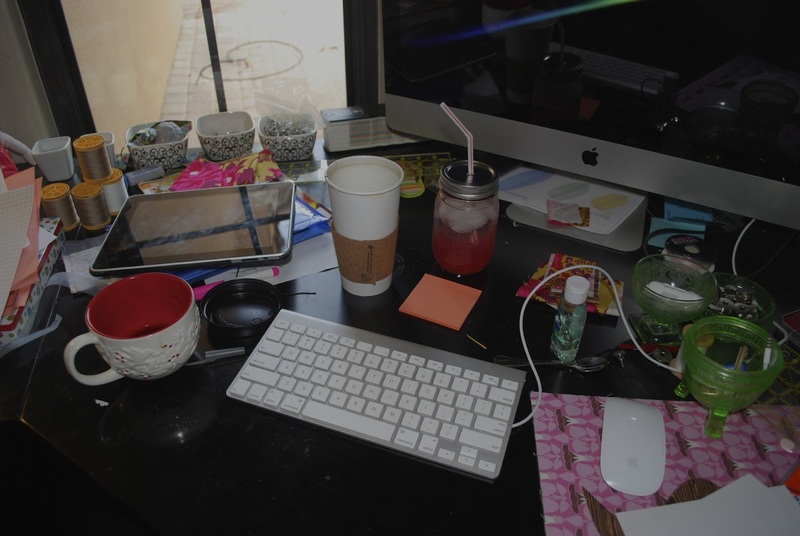 Love all your pictures and your desk looks far tidier than mine! What a beautiful block! Great to see all the uses you found for it! That is a block to keep, imagine it blown up to a full size quilt!Or just a lot of those blocks combined....mmmmmmm. I need to check my stash! Your stars block is fantastic, love the little wrap for your jar as well - what a great set. It looks so difficult but you make it sound easy. Lovely project! Clever idea and well costructed! Makes me think of other patterns going from small to large or vice versa... You saved my day! Great job on your new coordinated desk set! I love the star block. 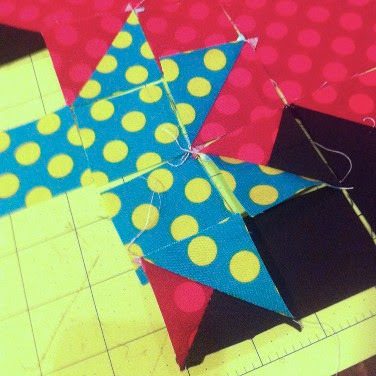 Such a simple but great idea doing the different sized stars on the one block. Thanks for sharing. Wouh! I love your star block! Love your new dotty desk set. I especially like the new mouse pad. Clever. great job on all the projects. Thanks. 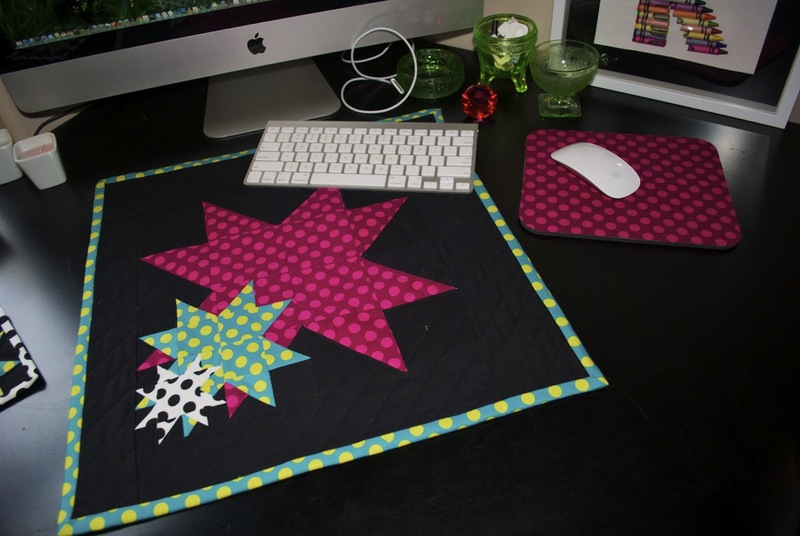 Great little quilt and I love the idea for jazzing up my mouse pad! Pretty cool block! Love seeing different designs like this! Love it! So creative and unique. Great use of your dots. I love your 3 dotty stars! the pink fabric really zings! Love your block. Thanks you so much for sharing the instructions. Your workplace looks perfect! Thanks for being part of the hop. Great idea for your desk! Love the mousepad idea! I love your star in star in star. Gorgeous and so tricky! Well done. You have done so much, and so cute. I too love the mouse pad idea. Your daughter was right going outside. Tell her thank you for us. Wonderful job , you are clever to do this out on graph paper and make your own pattern , thanks for the tutorial . Love to see others rely and use the good old graph paper method of drafting blocks. Your piece is delightful as well as useful. Really dresses up that work area. And love the mason jar!!! Thank you for sharing with us today. I love these echo stars! You have such tiny little pieces and all of your points turned out, I am envious. 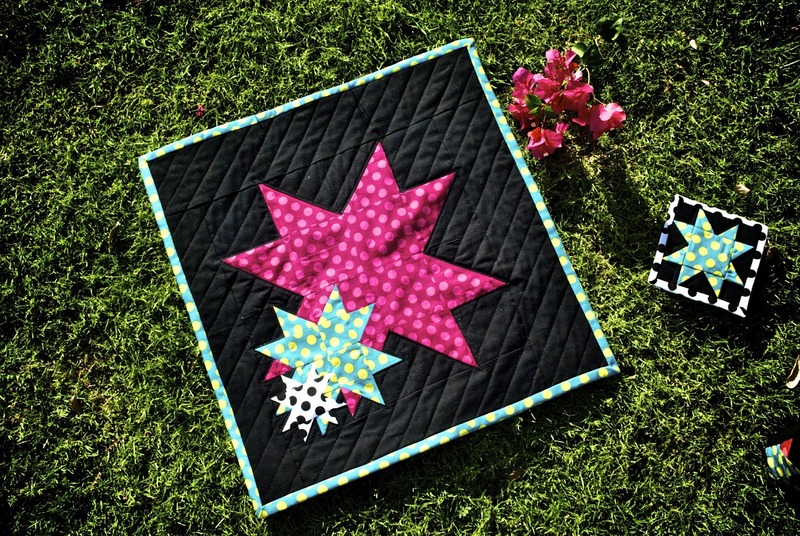 :) Thanks so much for sharing the tutorial and all of your other dots projects that match your mini quilt. I love them all! Very nice projects - love the 3 stars! Very nice and fresh idea of making the stars gradually smaller. The white polka dot fabric on the last one almost makes it look like there are holes in the fabric! Thanks for sharing. I just love your little quilt. And the jar cozy and coaster just look wonderful too!!! Thanks for sharing with us!! What a beautiful set of projects! They do wonders for your work area! I do all my designing on graph paper, too! I need to feel the pencil moving over the paper. There's something so satisfying about that! Looks so complicated and yet it's NOT! Thanks for sharing! I love all your quilts and projects. Perfect idea for the mouse pads. I hadn't thought about using wonder under and fabric to cover some of those mouse pads. I am glad you figured it out, it looks very complicated.It turned out so wonderful. WOW! I love everything you made. It is gorgeous. This is one block I have to make soon. I am also thinking of a baby size quilt with the 3 stars. Thanks for sharing. Hi!!! I love your stars!!!! How fun! Impressive. It all turned out great. I'm still looking at the palm trees - totally jealous. WOW...first impression...WOW! Your desk looks so inviting now....can you come help me make mine look so lovely? Excellent job and thanks so much for sharing. Gosh....I LOVE that design. Great job! It looks fabulous in those dots too. Ok, I love your cute little block BUT I LOVE YOUR MASON JAR!!! I think I'll make me one!! What a great idea!! I'm a new follower mainly cuz I luv luv your mason jar kind of thinking...Oh and becuz you also have a massy desk just like me!! Creative minds can't be bothered with neat desks!! That star block is so pretty! I have pinned it, because I would love to give it a try! Love, Love your idea and all the great projects that came from it. Wow! You are industrious! I love your design and fabrics. These turned out great for your desk. Great job! This was fun. Love it all! Your desk reminded me of my desk and then you prettied it all up! Super. Thanks for the tutorial too! What fun (and useful) projects with your dots!! Thanks for the tutorial!! Great ideas! Thanks for the tutorial! What a great design and a wonderful way to add some pizzazz to your work space. Lots of dots! I love the projects that you made. I really like the desk set and mouse cover. I think I feel the sewing coming on! Oh such great ideas to make my work area pretty too ! Thanks for sharing.I really like the stacked three stars that you designed. Very creative! Love the masson jar cover, the block looks great and all the other things you have done. I,too,drink out of a mason jar. I never thought to make a cozy for it. 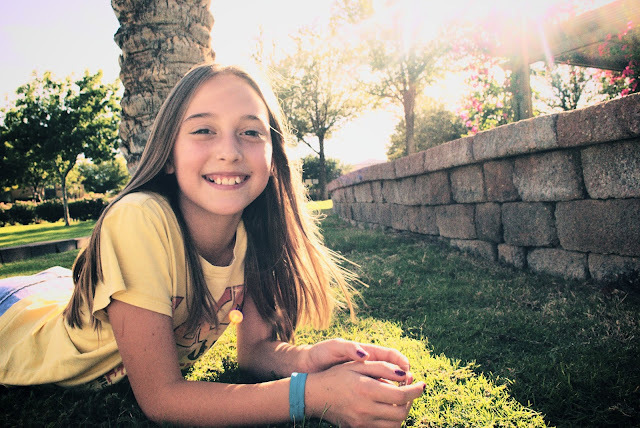 Smart girl, and to make it so pretty. I am going to have to try to figure out how to make one for my jar. Thanks for the ideas. Another reason why the blog hops are so fun. Wow fabulous!!! Thank you for figuring this out and then sharing it!!!! I'm a fellow blog-hopper today. Lovely, lovely projects! Thanks for sharing your wonderful block and other items with us! And Brie was right; it's great to see your projects in situ, but the light outside was divine! Love your little quilt. Thanks for the instructions because if you didn't give them, I was going to have to try and figure it out! 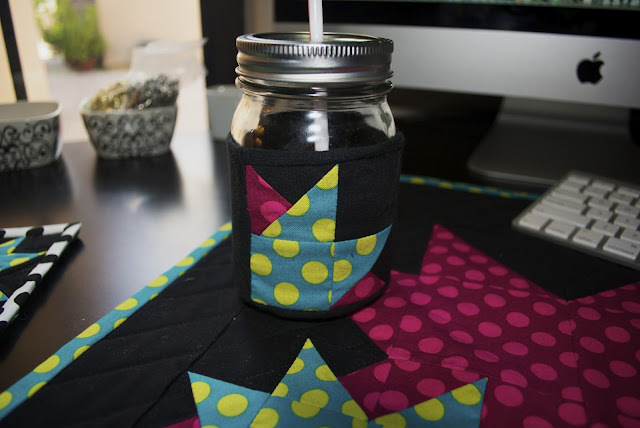 Love you mini quilt, your mousepad you should do a tute on recovering a mousepad, your coaster, and finally the very best is a mason jar cozy! We drink out of masons and can too! That would make a great addition at Christmas! Your block is awesome. I love that you went old school. Stellar (excuse the pun) block. Just love it to pieces. 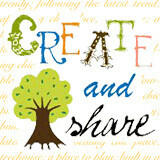 Thanks so much for designing it and then sharing the design. Great job on all of the desk accessories too. Love the sweat catcher. What a great block - thanks for sharing. 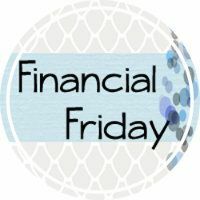 Love all of your projects here! What a great tip to make our mouse pads snazzy! Thanks for sharing! 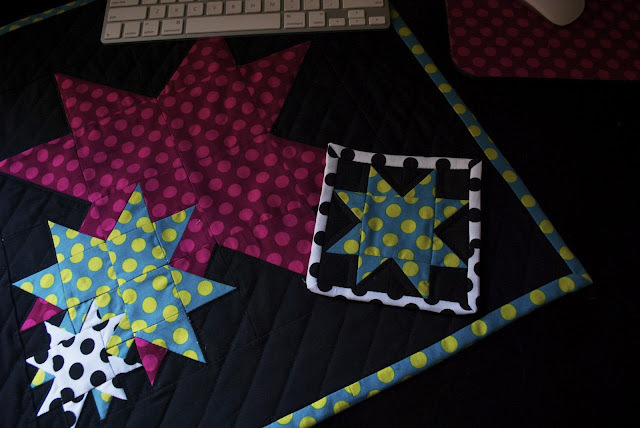 cute cute cute block.. makes me want to run down into my sewing room and make one.. :) Love your fabric choices..
wow love those star, really beautiful! I love how you made your work place " star studded!" Thank you for sharing, now off to clean up my desk. This is a wonderful project. Thanks for sharing and congrats on being one of the chosen. I love all the things that you made. They look truly awesome. 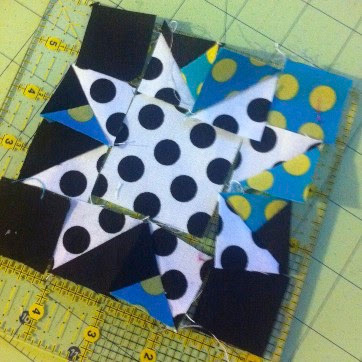 The little star quilt is beautiful, but I am afraid that I would do better at appliqueing it than I would trying to piece it. Thank you so much for sharing about how to cover a mouse pad. I need a new one, but didn't know that I could do this. The possibilities are endless. I could have a new one every week! !Thank you so much. What a great idea!! Thanks for the step by step otherwise I would never know how to go about doing something like this!!! Imagine this as a lap sized quilt or bigger? Ooooh Aaaah! Love your triple dotted stars. I like your block, and the cozies too. Very creative. Great polka dot project! Your tutorial is wonderful. Thanks for all the hard work. I really enjoyed how original your block was!!! 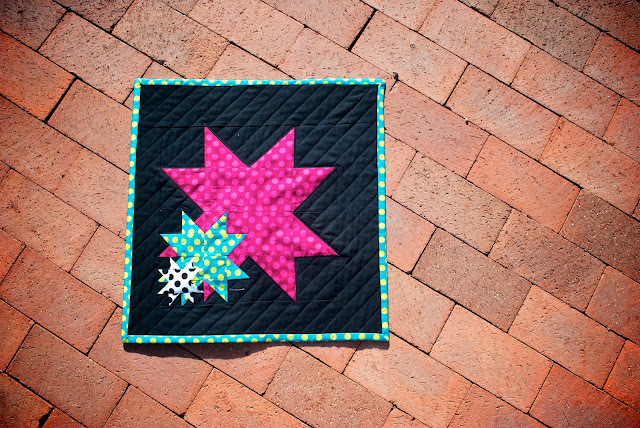 Love your echo star block! I use the old school method also...much of my work looks very similar to yours...graph paper, color pencils...I also really like your idea for your mason jar cozy.Nice! Beautiful star block, very creative.Thanks for sharing the pattern!! You are an engineer! An architect. A scientist. Tell about your Mason jar glass? How did you do the straw? Clever! Your Echo Star is my favorite block of the day. Well done, and I can relate to your preference of graph paper to the computer. I design that way also. Thanks for sharing. Great block - I love how those colors pop on the dark background! 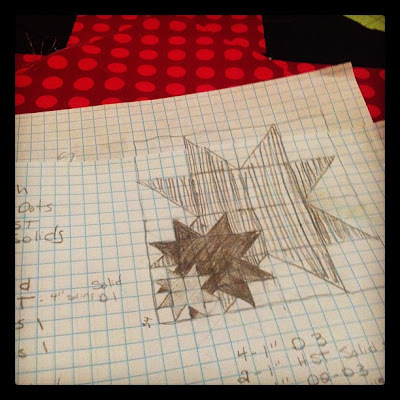 I love your echo star, and the old fashioned graph paper. Great idea for a jar cozy. How do you make the hole for the straw? Your block is striking! I love it - can't wait to try it! I loved your design!! Your jar cozy is so cute!! 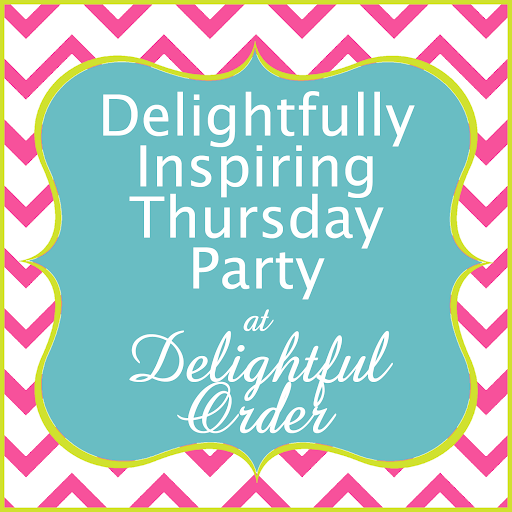 It looks great and inspiring, hope to see ya on my dots to dots day ! Wonderful post! Your desk set is super and your daughter is beautiful! 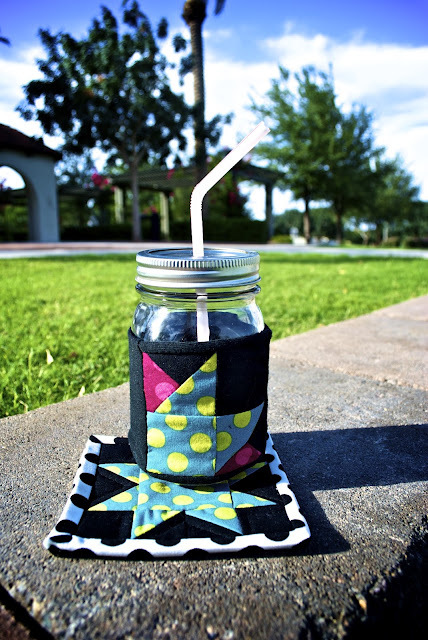 Thank you so much for sharing :) I really like your mason jar with the straw through the lid ... brilliant! Thanks for that great tutorial! And extra kudos for taking pencil to paper to design it in the fiest place, that's one of my scary areas. All of your projects are wonderful and thanks for the tutorial. YIKES!! Very nice! I admit though that I don't think I could do it. Looks very complicated to my scrambled mind! You have done yourself proud! Very nice! Love your Dotty Staronstaronstar! Looks awesome on your desk, along with your mug rug, cozy and mouse pad! All color-coordinated and looking gorgeous!! What do I think? Well, wonderful. Your block is so well designed; love that you can see the other blocks peeking out from behind - clever. The cozy for your drink is a great idea and I love your mouse. We all need a little dotty in our lives. Love the stars desk pad and the mason jar wrap...and the mouse pad, who would have thought. Thanks for sharing and for your inspiration. 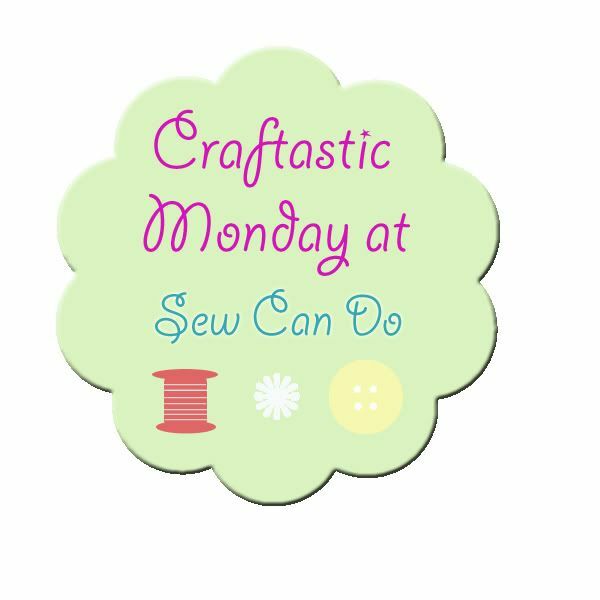 Happy stitching and blog hopping! Those echo stars looks great! I love seeing the drawing on graph paper. Your desk also looks really great, now, too! Well, isn't your idea a darling one? I love the practical pieces you made for the desk. They work so well together and have your desk looking very spiffy! The star, star, star pattern is really interesting. Love the surprise of seeing the star points in the background. I looked at your projects this morning, thought about them on and off and decided that I had to come back and say AWESOME!! Thanks for the tutorial as well. I've never seen this star block before and I think it looks GREAT! I love how you prettied up your desk. That is one clever pattern! GREAT projects! I love your projects. You did a wonderful job!! What a beautiful star block and such fun projects! Thanks for sharing! Wow, what a fabulous block, it's so complex! What a wonderful idea....I love it!! Pretty stars! I love the way it looks. Thanks for sharing your block and all of the other pretty projects. I love stars, and they turned out great! Boy, you are creative! I love all the dots! Great block and tutorial! Thanks for sharing it! 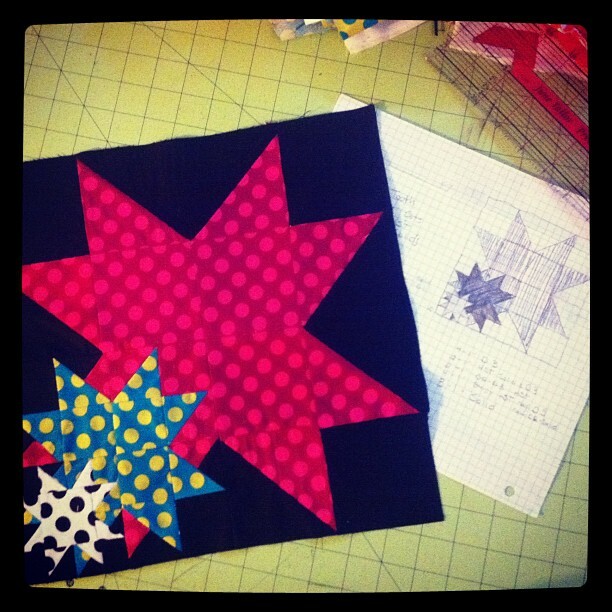 I love star blocks and your Dot Stars are wonderful1! Great tutorial! Thanks so much. I love your dot desk set. So dotty and wonderful. And Brie, is a doll. Thanks for sharing. I'm catching up with the blog hop and you desk set is just awesome! Dots are so fun so it's nice that you will have some pretty things to look at while you're at your desk. 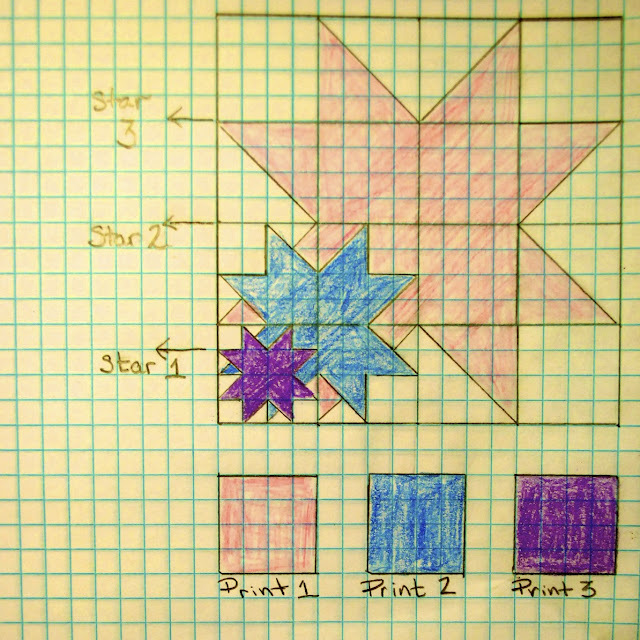 Love your three stars!~ Thanks for doing all the hard work for us and sharing the pattern. I'd love to try this. I also love your mason jar glass, too cool! Thanks again for sharing all your items with us, Super job! I love your star block. The color pops against the black background. 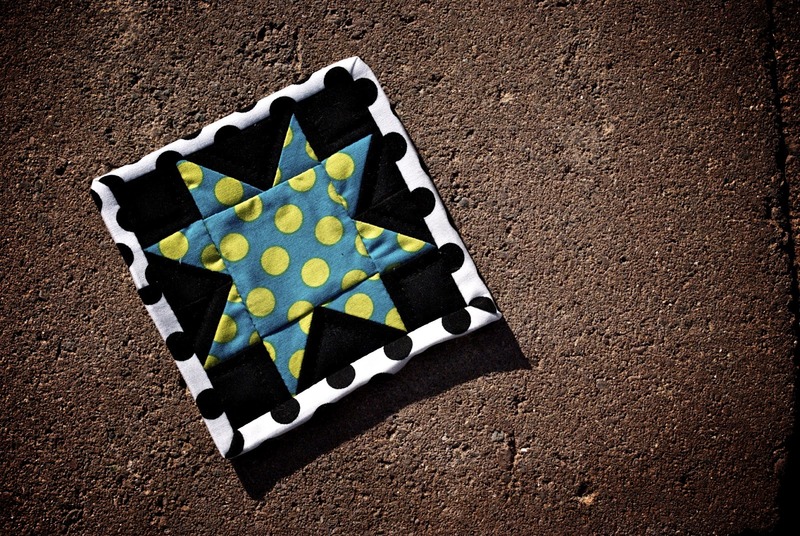 Nice star block - two of my favorite things: stars and polka dots. Oh yeah - love daughters, too! Nice job on all counts. Beautiful block and great tutorial!!! Thanks for sharing. I am enamored with your dotty projects. 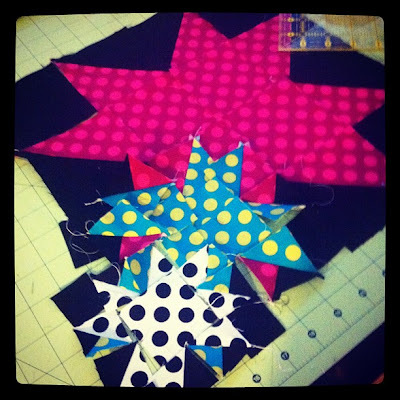 Thanks for showing how to make the nesting stars - I'm going to try that! 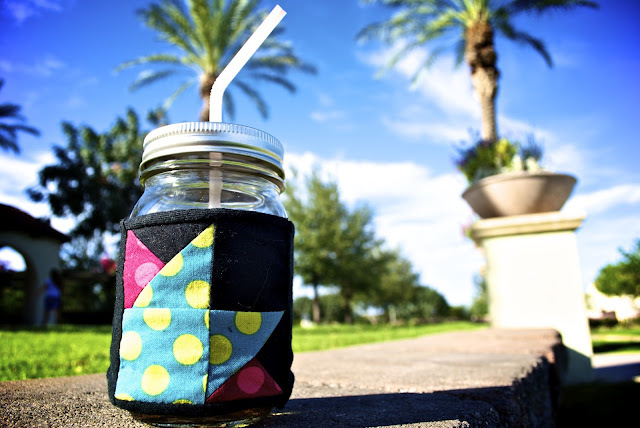 And the mason jar cozy... so cute. I'm a new follower to your blog. Is this 12" finished or unfinished? is this block 12 inches finished or unfinished? Nakey Baby Templates Are now Available in my Shop!! I no longer blog here and can't keep up with the demand! But, I still want to offer this project!! Go to the store tab on the top of page!! Come Join Me!!!!! Links and Parties galore!!! !